Hailing from South Africa and comprising members Shaun Morgan (vocals, guitar), Dale Stewart (bass), and John Humphrey (guitar), Seether embraces a brand of heavy metal mostly associated with the post-grunge era of alternative music, complete with crunchy distortion and brooding textures. The band emerged in 1999 as Saron Gas (a name taken from the back of a sound effects CD) and released their debut album, Fragile, the following year on Musketeer Records. In a country whose musical tastes center around pop and indigenous music, Fragile found impressive chart success. 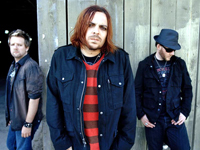 Across the Atlantic, the U.S.-based Wind Up Records caught wind of the band’s growing popularity and signed the South African bandmates, who changed their name to Seether in light of Saron Gas’s similarity to the lethal nerve agent sarin gas.